Hong Kong dim sum food came a long way from the traditional tea houses that people taking their pet birds with them in the morning to a small restaurant chain serving it 24/7. Shrimp dumpling (a.k.a. Ha Kau) is the MUST to everybody. 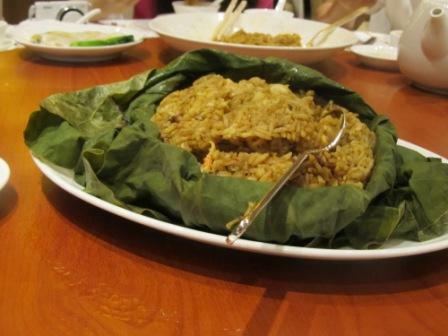 A typical dim sum, but to make a GREAT "Ha Kau" is NO ordinary knowledge to some people. Some restaurants are renowned for their own versions. This one was from Moon Kung Restaurant. 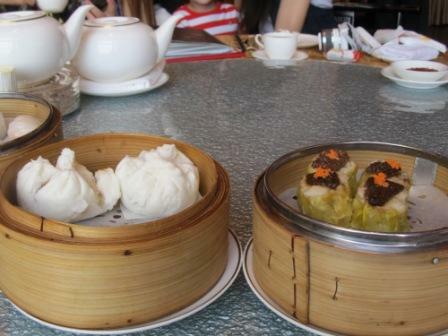 Dim sum is mainly the southern Chinese cuisine. Most of it is steamed, such as shrimp dumpling (aka "Ha Kau"), "Siu Mai", roasted pork bun, chicken legs (yeah, you read it right. Chicken legs are dim sum, too. We called it the "Phoenix claws") and so forth. 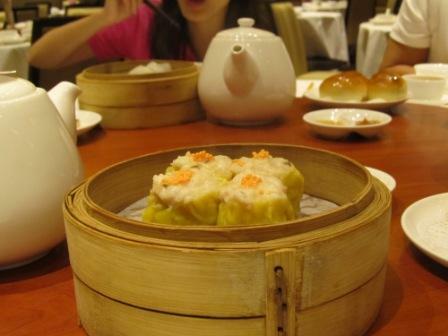 "Siu Mai" - Different restaurants have slight difference of ingredients and presentations. This is from Fook Lam Moon Restaurant. As it evolved, it started to incorporate some deep-fried dim sum, like spring rolls, Chinese traditional dessert and many different varieties. It is always served during lunch. 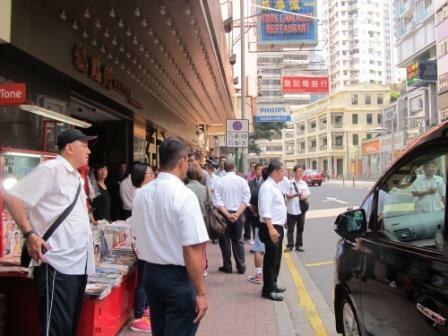 In the past 2 decades, mom and pop stores started to serve Hong Kong dim sum food throughout the day. Now, you can have it at any time whenever you want, even in some restaurant chains. In the past, tea houses opened at 7am. After the morning exercise and Tai Chi, people brought their pet birds into the tea house to enjoy dim sum and tea. It was more like social gatherings than breakfast. If you happen to see any Hong Kong movies with the stories about that era, you would see many, many bird cages hanging from the ceilings or sitting on the tables. It was during my grandparents era. You could barely find any restaurant or see any screen like this nowadays. Eventually, restaurants replaced these tea houses. 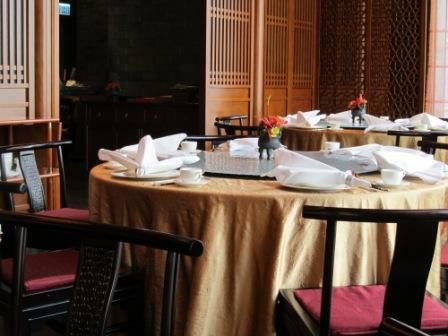 On top of the traditional tea house dim sum, they added more varieties which are heavily affected by other cuisines. 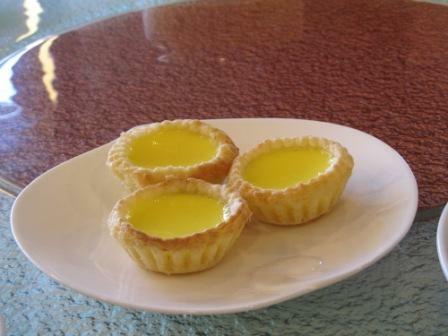 As soon as you see some of the examples below, you will know what I meant, such as jello with fruit, mini egg tarts, mango pudding, shark fin dumpling, Chinese sausage bun and many more. 99% restaurants serving dim sum still serve it during lunch. 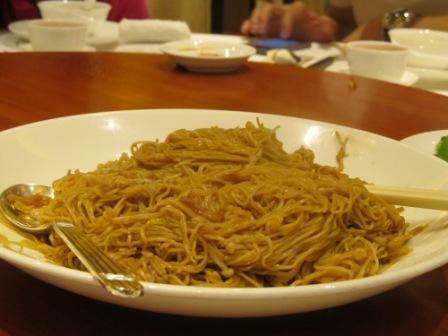 In addition, you can also order stir-fried dishes. Back then, all dim sum was always served in a bamboo steamers. They would stack up on a tray while the staff in the restaurant would walk around and yell what were on the tray. Then, these bamboo steamers were stacked up on the movable steaming tables. In front of a steaming table, there were signs telling you what kind of dim sum it carried. So, you picked whatever you want. Nowadays, most restaurants would have you to place the order by checking on their dim sum menu by yourselves. They would prepare and cook at the time of your order which supposed to make it fresher. Men...how much I miss the fun part of the good old days. My family used to go to have dim sum for lunch during the weekends. Saturdays would be with my mom's family and Sundays with my dad's. You can also buy microwaveable Hong Kong dim sum food from any supermarkets back home. Of course, they are not as fancy and tasty as the one served in the restaurant. But just to satisfy the crave of it, it is a good way to go. This 4-star hotel is comparatively new, so as the restaurant. You would pass by an area which is old and dirty. At night, it's super quiet. But the hotel has a very nice lobby; good food and service. When we were there, we didn't need to wait for our table; but they still prefer to make reservation ahead of time. (From left to right) At the corner, it is "Ha Kau". Next to it on the right is steamed bun filled with roast pork and "Siu Mai". This is a huge restaurant chain and has been in business since I was a kid. It own its local fast food chain, several restaurant chain serving Chiu Chow, Shanghai (coming soon - link to HK Shanghai Food page), Peking (coming soon - link to Hong Kong Peking Food page), Cantonese food and run the Starbucks in Hong Kong. The quality may not be as great as those restaurants I introduced here. But it always meets the standard. Of course, the price is no standard at all. In my opinion, it's expensive. For tourists like you want to play save, it won't hurt to try out their food. 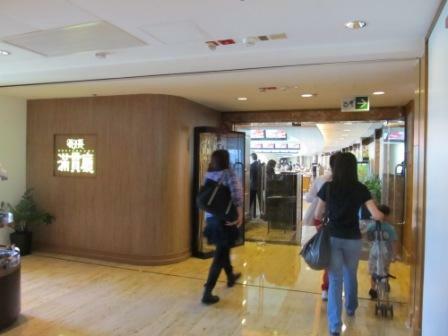 A restaurant where there are always rich people, Hong Kong movie stars and celebrities going there. There are 3 floors of the restaurant. The space of each floor is in decent size. You would be surprised how fast it got filled within an hour. When we first got there, there was only one paparazzi. When we left about 2 hours later, there were at least 20 of them waiting. This is my all-time favorite. There was a time that my family had the gathering here every week to devour their Hong Kong dim sum food. 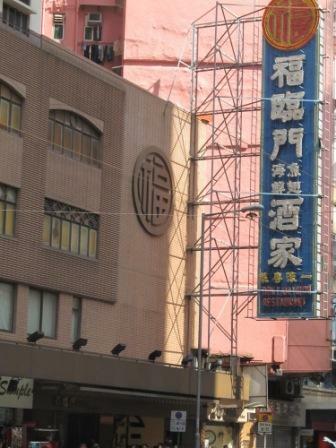 I had a dinner buffet (coming soon - link to Hong Kong Buffet Food page) here once. If you love buffet and can eat a lot, this is a great place to go. The price for buffet is very expensive. In addition, the food quality is Superb. The difference of now and then was that the coast line had been extended further away from the building. The view is not as great as in the past, comparatively speaking. I had been here for a couple of times. The food is always good. It could be the timing. Every time when we were here, it wasn't full house. My sister drove us here during our last visit. She parked the car in the in-field where we had the chance to take a closer look of the horse racing course. There is playground in the middle of it. We saw some people doing exercise and wondered if they have to be the member. My mom said that they had been here for a live concert recently. We walked along the driveway from the garage to the restaurant. The entrance was a bit difficult to find, especially if you are in a moving vehicle. Like my visit a few years ago, the food and service was great. The cheapest meal we ever had in those 2 weeks of our Hong Kong Vacation. With this kind of food and services, it only cost us HKD500. After lunch, we walked across the lobby to go to the Hong Kong Racing Museum. 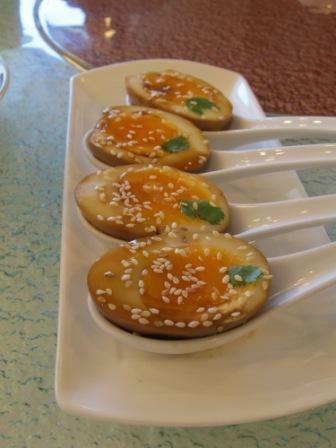 Tea hard-boiled eggs. Very nice presentation, isn't it? This is my another all-time favorite. The quality of food is great. There was a period of time my family always love to dine out here for Hong Kong dim sum food and Cantonese food for dinner. But a manager was too hard sell in one Mid-Autumn Festival that it scared us to stay away from it. For foreigners, like my hubby, steamed dim sum is not on their favorite list. But if you still want to try it out, feel free to walk in some mom and pop stores with very low price to have this "adventure". It's very easy to figure out if they serve dim sum. If you see they have several stacks of small size bamboo steamers in their kitchen or at the entrance of the restaurant, that should be it. All of these restaurants serve Hong Kong Cantonese food at night. The quality of food is for dinner is always as good as lunch. I must admit that those I recommended are comparatively pricy. But the quality is guaranteed. Also, keep your eyes open. 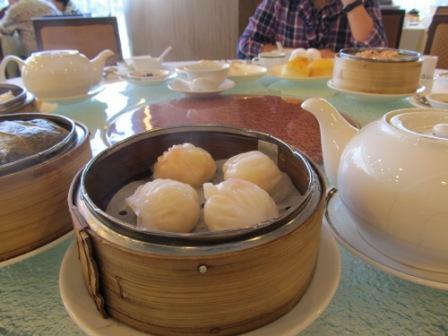 You may come across some great Hong Kong dim sum restaurants serving great food, but low price. For more pictures of different varieties of Hong Kong dim sum food, check out our Facebook pages. Check out my blog for more simple recipes inspired by the Hong Kong dim sum food.